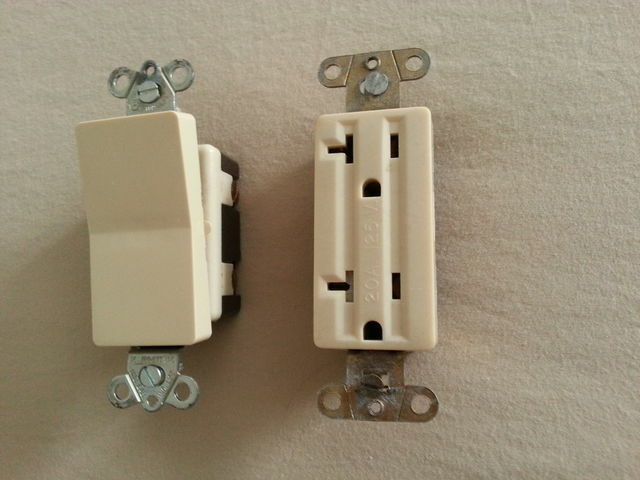 Here two vintage decorator devices: a Circle F No Klik switch and Sierra Sola 20A outlet. Hmm didn't know Decora devices were around in the 70s. Most I've seen are 90s or newer. They didn't start using Phillips head screws for the live terminals and mounting screws until sometime in the 90s, I think when cordless drills were becoming more popular. Almost everything is done with impact guns now. I still tighten my ground screws with a screwdriver since they strip out very easily with the impact gun. Feb 10, 2019 at 07:47 PM Author: Cole D.
Leviton Decora came out in 1972 I think. Before that they had an older style called Centura that came out in the late 60s, but they won't fit a Decora size plate opening. I've never seen that but there are a lot of NOS ones on eBay in various colors. Sierra, Slater and Pass and Seymour also came out with decorator style in the early 70s. I guess Sierra was technically first with a decora style because they had those triplex outlets in the 50s. But again they won't fit a Decora plate. Check out 20A GFCI on Flickr. https://www.flickr.com/photos/14519740@N07/ He has some interesting stuff if you like this kind of thing. Hmm interesting. Thanks for the link, just followed him! This is the style plug and switch my house has in it. the house was built in 1996, and I believe all the house plugs and switches were replaced before I moved in late 2017 as the plugs are all really tight and the switches are very clean. My Uncle's house was built in 1985 and has all the orignal Decora switches. It has standard outlets though.